You'll get in some beach time at Rockingham Beach and South Beach Recreation Reserve. 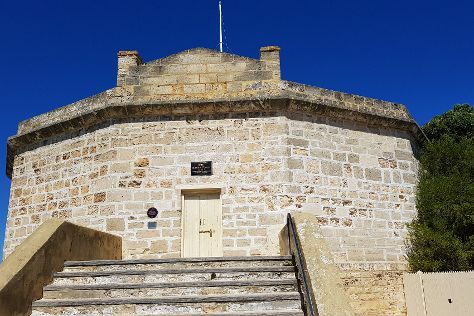 You'll explore the less-touristy side of things at The Fremantle Round House and St. Mary's Cathedral. You'll find plenty of places to visit near Perth: Point Peron (in Rockingham), New Norcia (The Monastery & New Norcia Museum & Art Gallery) and Barna Mia Nocturnal Wildlife Experience (in Dryandra). On the 11th (Wed), spend the day exploring the area around Logue Brook Dam. Dedicate the 8th (Sun) to wine at some of the top wineries in the area. There's much more to do: contemplate in the serene atmosphere at St. George's Cathedral, admire the masterpieces at Fremantle Arts Centre, kick back and relax at Mullaloo Beach, and stroll through Trigg Beach. To see more things to do, reviews, photos, and other tourist information, go to the Perth trip itinerary builder website . Use the Route module to see travel options from your home to Perth. In September, plan for daily highs up to 24°C, and evening lows to 9°C. Finish your sightseeing early on the 17th (Tue) so you can drive to Yallingup. Situated right at the southwestern tip of Australia, the town of Yallingup lies on the shore of the Indian Ocean. Kick off your visit on the 18th (Wed): kick back and relax at Injidup Beach, do a tasting at Carpe Diem Vineyards, then do a tasting at Knotting Hill Estate Vineyard, and finally learn about winemaking at Happs Winery and Cellar Door. Keep things going the next day: do a tasting at Cape Naturaliste Vineyard, then enjoy the sand and surf at Smiths Beach, then do a tasting at Windance Estate Wines, and finally look for gifts at Howling Wolves Wines Cellar Door. To see traveler tips, ratings, other places to visit, and other tourist information, you can read our Yallingup road trip app . Traveling by car from Perth to Yallingup takes 3 hours. Alternatively, you can take a bus; or do a combination of train and bus. Finish your sightseeing early on the 19th (Thu) to allow enough time to drive to Margaret River. On the 20th (Fri), look for all kinds of wild species at Eagles Heritage Wildlife Centre, then learn about winemaking at Providore, then learn about winemaking at Vasse Felix Winery, and finally do a tasting at Howard Park - Margaret River Winery and Cellar Door. On your second day here, contemplate the long history of Water wheel, explore the ancient world of Hamelin Bay Jetty, do a tasting at Redgate Wines, then enjoy the sand and surf at Margaret River Mouth Beach, and finally tour the pleasant surroundings at Surfers Point. To see photos, traveler tips, reviews, and tourist information, go to the Margaret River sightseeing planner. Getting from Yallingup to Margaret River by car takes about an hour. Other options: take a bus. On the 22nd (Sun), wrap the sightseeing up by early afternoon so you can drive to Denmark. Here are some ideas for day two: learn about winemaking at Moombaki Wines, then identify plant and animal life at Conspicuous Cliff, and then contemplate the waterfront views at Walpole-Nornalup Inlet. To see ratings, photos, and more tourist information, use the Denmark trip itinerary builder tool . Drive from Margaret River to Denmark in 4 hours. Alternatively, you can take a bus. In September in Denmark, expect temperatures between 21°C during the day and 9°C at night. Cap off your sightseeing on the 24th (Tue) early enough to go by car to Albany. Here are some ideas for day two: get a new perspective on things with Boat Tours & Water Sports. For maps, ratings, more things to do, and other tourist information, you can read our Albany road trip planning site . You can drive from Denmark to Albany in an hour. Another option is to take a bus. In September, daytime highs in Albany are 21°C, while nighttime lows are 9°C. On the 27th (Fri), wrap the sightseeing up by early afternoon so you can travel back home. Esperance is a town in the Goldfields-Esperance region of Western Australia, on the Southern Ocean coastline approximately 720km east-southeast of the state capital, Perth. Twilight Bay has been added to your itinerary. Keep things going the next day: enjoy the sand and surf at Thistle Cove and then enjoy the sand and surf at Twilight Bay. For other places to visit, traveler tips, where to stay, and tourist information, go to the Esperance trip itinerary app . Drive from Albany to Esperance in 5 hours. Alternatively, you can fly; or take a bus. In September, daytime highs in Esperance are 22°C, while nighttime lows are 9°C. On the 30th (Mon), wrap the sightseeing up by early afternoon so you can travel back home.